Rep. Beto O'Rourke, the Democratic nominee for U.S. Senate in Texas, has accepted over $170,000 in bundled contributions from J Street PAC, despite swearing off special interests in his campaign to unseat Republican incumbent Sen. Ted Cruz. O'Rourke, a member of the House of Representatives since 2013, faces criticism for violating a pledge he made when first announcing his Senate bid to not accept contributions from any political action committee (PAC) or special interest group, The Daily Caller first reported. Financial disclosure forms filed with the Federal Elections Commission show O'Rourke's campaign has accepted a total of $172,285 in bundled contributions from J Street PAC, a liberal advocacy group noted for its harsh criticism of Israel, this election cycle. J Street PAC did not contribute directly to O'Rourke's campaign; rather, the group used its resources to collect contributions from "371 unique donors" on the candidate's behalf, according to The Dallas Morning News. Emily Miller, a spokesman for the Cruz campaign, denounced the O'Rourke campaign's ties to J Street PAC in a statement released Monday. "Rep. Robert ‘Beto’ O’Rourke travels all over Texas claiming that PACs are corrupt, and he’s made his alleged rejection of PAC influence a cornerstone of his campaign," Miller said. "But now we know that O’Rourke’s actions have not matched his words, and he has accepted significant fundraising support from the extremist, yet influential, anti-Israel J Street PAC to aid his candidacy." Cruz's campaign called on O'Rourke to return the donations "immediately" if he was serious about standing up to special interests. "If O’Rourke does believe that PAC support is corrupting, then he should immediately return the $172,285 raised for him by J Street PAC," Miller added. O'Rourke, who announced his candidacy last year, has ignited hopes that a Democrat can win a Senate seat in the Lone Star State for the first time since 1988. In an effort to bolster his bid, O'Rourke has traversed the state, visiting all 254 Texas counties in an effort to show why he's a better fit to represent Texas than Cruz. As O'Rourke makes his case to the heavily conservative state, the candidate has been unwilling to temper his criticism of President Donald Trump or stymie his liberal principles. 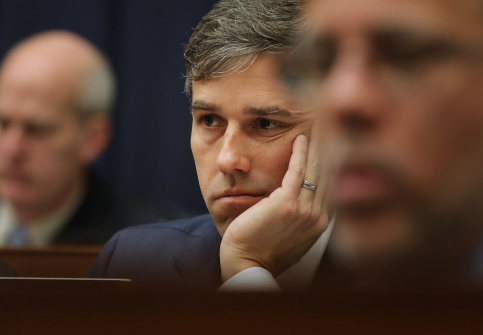 In April, O'Rourke admitted he had seen enough of the president's actions to compel him to vote for impeachment proceedings if he joined the Senate. The candidate has also expressed support for universal health care, gun control, and relaxed immigration laws. During his tenure in Congress, O'Rourke has staked out positions that are directly aligned with the political goals and interests of J Street. In June, he denounced the Trump administration's decision to move the U.S. embassy in Israel to Jerusalem, the nation's recognized capital. At the time, O'Rourke castigated the move as "provocative" and asserted it would only serve to incentivize "incitement to violence." O'Rourke's viewpoint is in line with J Street, which has lambasted the embassy's relocation as "reckless." O'Rourke, like J Street, is a prominent supporter of the Iran nuclear framework brokered by former President Barack Obama. In 2015, O'Rourke joined several of his fellow Democrats in refusing to attend an address to Congress by Israel Prime Minister Benjamin Netanyahu. At the time, O'Rourke cited the Israeli leader's stringent opposition to the Iran nuclear deal as sufficient reason for boycotting the speech. This entry was posted in Politics and tagged 2018 Election, Beto O'Rourke, Campaign Finance, Democratic Party, FEC, Israel, J Street, Republican Party, Senate, Ted Cruz, Texas. Bookmark the permalink.